This week, Syrian civil society actors met on the margins of the “Brussels III” Conference. The diverse group of Syrians travelling from inside and outside of Syria came together to discuss the needs and challenges facing Syrian civil society, and to engage with the international community, in particular with regard to the need to protect the space of civil society and to promote their effective participation in the peace process. The group met in closed-door sessions and presented their views to the EU High Representative/Vice-President of the European Commission Federica Mogherini and the UN Special Envoy for Syria Geir O. Pedersen. They also met with representatives of Member States. 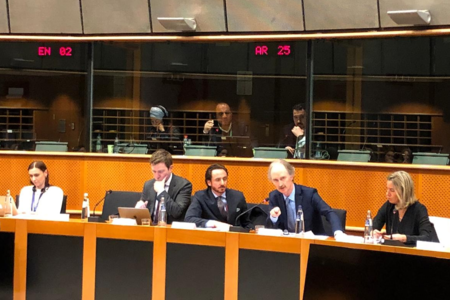 The Brussels III Conference “Supporting the Future of Syria and the Region» took place on 12-14 March 2019 and was hosted by the European Union and co-chaired by the United Nations. Jointly the EU and the UN called for financial support for Syrians and humanitarian aid in Syria and the neighboring countries, and for continued support to the UN-led political process. At the request of the United Nations, NOREF and its partner swisspeace supported the organization of the civil society meeting, as part of their engagement for the inclusion of civil society in the UN-led intra-Syrian talks in Geneva.